I am so excited that you could come to the country today, it is a beautiful fall day. We have been enjoying all the Fall Festivals and wonderful food that is offered at the booths this time of the year. We went to the Apple Orchard the other day and brought home a large basket of Apples, which we have been busy making all kinds of goodies with. Now come on in and lets see what you have brought to share with us today, I can't wait to taste it. Thanks for letting us link up. Hope you're having a great week Helen! Thanks for hosting! I've linked up the most delicious chicken dish ever: Baked Chicken Kiev. 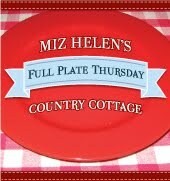 Thank you for hosting Miz Helen! Enjoy the rest of your night! Thanks for the great party, Mrs. Helen! Have a great weekend! Hi Miz Helen, I hope you're having a good week. Thanks so much for hosting each week. Thank you for hosting another great party, Miz Helen. Have a great rest of the week! Thanks so much for hosting. This is my first visit! Thanks so much for hosting. Hope you have a great week. Thanks for hosting Miz Helen!! I hope you're having a wonderful week! Wonderful recipe choices today! Thank you for hosting. We linked up a terrific fagioli soup! Thanks so much for hosting. We really appreciate all you do for us. Have a great weekend. We went to our orchard not to long ago... we've made apple crisp, applesauce, and apple butter... so much fun. Thanks for your party... it is always wonderful. Thank you for hosting :) Have a wonderful weekend! So many mouth watering links to check out! Thanks for hosting! Thanks for hosting. What a great bunch of link ups this week. HI! I'm Rebekah from http://www.Likethistrythat.wordperss.com. IThis is my first hop here, can't wait to check out some of these food blogs and recipes, thanks! i adore apple orchards! they're so real. and romantic. and historic. i can't wait to see what you come up with. p.s. there are still a few more hours to share your seasonal & real/whole food posts with the linky party I host - the Wednesday Fresh Foods Blog Hop - I hope to see you there! Good morning Miz Helen! Thank you for being our hostess! I love all the fall selections I see! Today I linked my newest post, "A New England Breakfast", where I share a scrumptious autumn breakfast and talk about how traveling changes your perspective! Have a blessed week! Hi Miz Helen! I'm glad you tried my twice-baked potatoes - did you enjoy them? My cousin made them this week too and said her whole family liked them! This week I'm sharing my favorite brisket recipe. It's simple and perfect. Thanks so much for hosting, Miz Helen! This week I've shared a recipe for Gluten Free Spiced butternut squash scones (very much like pumpkin, but makes bright orange scones!). Thank you for hosting Miz Helen! I've shared my recipe for Orange and Sultana Cake today! Thanks so much for hosting. Looks like I have a lot of recipes to drool over again this week. Have a fabulous day! Thanks for another party, Miz Helen! I linked "Spaghetti Squash - Grain Free Noodles". You might also be interested in "GAPS and Osteoporosis". Hi Miz Helen! Thank you so much for hosting! This is one of the hightlights of my week - there are so many good things to look at. I shared my Simple Lemon Salad Dressing and Creamy Italian Chicken. Hi Miz Helen, thanks for hosting this week after week. It's no easy job. I contributed a dog biscuit recipe that can also be a great teething biscuit for young children. These biscuits are so good, I love to eat them myself, and I've finally figured out the right ingredients so the hungry hounds like them more than any store bought biscuits. Hope you have a great week! Cheers to another week full of creative and delicious things! Good morning, Miz Helen, I've brought some bread to share! Thank you for hosting, have a great weekend! I keep seeing you all over blogtown and I feel like we're old friends so I'm crashing your party without an invite but I brought yummy stuff so I'm sure you don't mind. Thanks for hosting and have a great week. Hey Miz Helen! Hope everyone is having a great week and getting ready for another super weekend. For those of you that enjoy Indian food and would like to give it a try at home, I've posted a recipe for Saag Paneer -- spinach, ginger, tomatoes and fresh-made cheese. The cheese is actually pretty easy to make on your own. 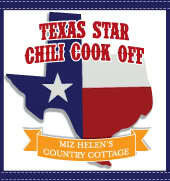 Thank you, Miz Helen, for featuring my Crawfish Etouffee! I very much appreciate it! Hi Miz Helen, There are so many delicious dishes this week. Thanks for hosting. Thanks for hosting Miz Helen. :) I see lots of interesting links here this week. I've linked my tutorial on Bread Making for Beginners. Enjoy!